Michael Williams poses in front of his photo from 1977 at the Patient No More exhibit. I have been a frequent visitor to the Longmore Institute's Patient No More Exhibit, which opened in July at the Ed Roberts Campus in Berkeley. Every time I go, I marvel how well the exhibit tells the story of how the first piece of Federal disability rights legislation came about. I played a small part in these events. With my KPFA radio press pass, I was able to move freely in and out of the sit-in at the San Francisco Federal Building while other protestors could not re-enter if they left the building. After weeks without any federal response, a contingent of San Francisco protestors, including myself, traveled to Washington, DC, to directly confront President Carter, Congress, and Health Education and Welfare Secretary Califano and demonstrate on a national stage. My strongest memory of the San Francisco 504 protest in Washington, DC is John King and me crashing Joe Califano's luncheon speech at the National Press Club. Here's what happened when I got in to Secretary Joseph A. Califano's address at the National Press Club luncheon on April 27th, 1977. (Remember, I had a KPFA radio press pass.) I don't remember the hotel it was in, or the subject of JC's blathering; all I remember is John King, me, Evan White, and KGO cameraman Ray Weiss entering this fancy hotel, taking the elevator to the lower ballroom where we found ourselves surrounded by a sea of guys in suits wielding walkie talkies. I had a slight moment of panic when I thought, Well, if I didn't have an FBI record before, I certainly do now. John and I checked in at the press table, and to my amazement they let us enter the ballroom with no questions asked. There didn't seem to be any protocol as to where people could sit, so John and I grabbed two seats at a front table right under the dais. We ate the cliché chicken luncheon meal; it tasted just as cliché luncheons found in novels do. The meal ended and Califano began his talk. As I said, I don't remember what he was talking about, but I do remember staring daggers at him all the way through his talk. When the talk was over and the floor was opened for Q&A, John King asked a question that to this day I don't understand the meaning of. He asked why the security level had been raised to yellow. "Is that because of the protests?" I was baffled; Califano was puzzled. Califano said he didn't know of any yellow alert, but the protesters should be pleased in a few days. The luncheon ended shortly after that, and everybody headed for the elevators, included Evan, who got in real trouble for shoving his way onto Califano's elevator. Meanwhile, when I got outside, I wasn't watching where I was going and careened off the sidewalk curb onto the hotel driveway, all of which Ray Weiss caught on KGO's videotape. That was the end of my association with Joseph A. Califano until the evening of April 15th, 2004, where the Secretary, accompanied by his wife, was appearing in Berkeley at Cody's Books, to plug his memoir, Inside: A Public and Private Life. I was among the scattered few in the audience. As I was listening to his remarks, I wondered if he would mention anything about 504. Well, indeed he did—including that bit about the feared headline, "Dog Bites Cripple." To my utter embarrassment, my remarks were greeted with vigorous applause by the assembled few. I glanced over to Mrs. Califano. She was staring daggers at me. 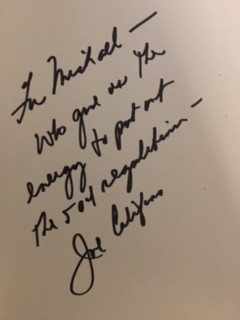 "For Michael—Who gave us the energy to put out the 504 regulations—Joe Califano"
While he was signing my book, I stole a glance at Mrs. C: She was still staring daggers at me. *This quote is typed and punctuated exactly as input into my speech generating device for my intended pronunciation.